Bliss Bennet. The passion of historical romance. Bliss Bennet writes smart, edgy novels for readers who love history as much as they love romance. Ackermann’s August 1815 issue prints a detailed description of the battles of Quatre Bras and Waterloo, more than 11 pages long. It also reports on the legislative sanctioning of a monument in commemoration of the victory, as well as a call for a general subscription throughout the country for relief of widows and orphans of men killed in the conflict (151 officers, 2, 284 “men,” Ackermann’s reports). 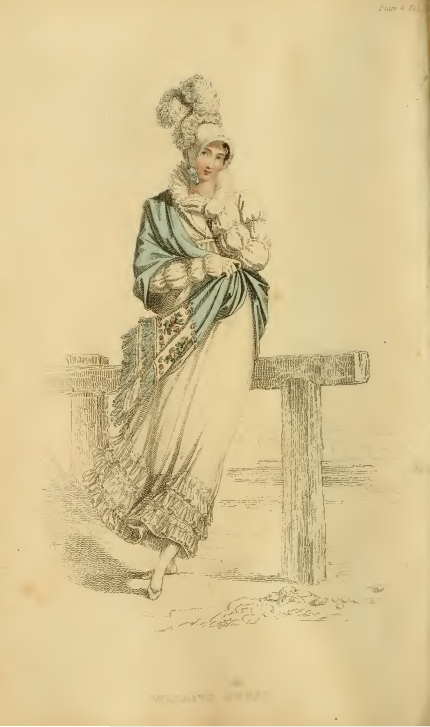 This month’s plates do not feature such low-cut dresses, however. The Evening Dress of plate 10 covers much of the back with zig zag rows of tull and satin (I wonder if this continues on to the bodice? ), which is meant to match trim which ornaments the gown’s hem. The accompanying cap is likewise made of satin and gathered tull, which looks both fashionable and cool for August’s heat. 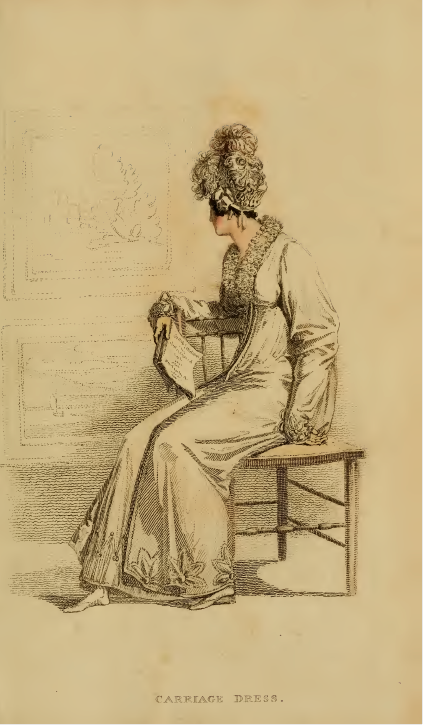 The bodice of the Promenade Dress (plate 11) is rather high compared to other dresses featured in the journal this year. The simple lines of the dress are accentuated by the small stripes of the gown, which is made of satin-striped sarcenet of celestial blue and white. The details of the sandal ties in the plate are quite unusual, although no comment is made about them in the description beyond the fact that they are “crossed high up the ancle with blue ribbon.” Was our illustrator taking liberties? Or did some creative shoemaker lace ribbon up the middle of the top of the foot, almost in a gladiator-style sandal? If you know of any similar extant examples from the period of similarly laced sandals, I’d love to see them! 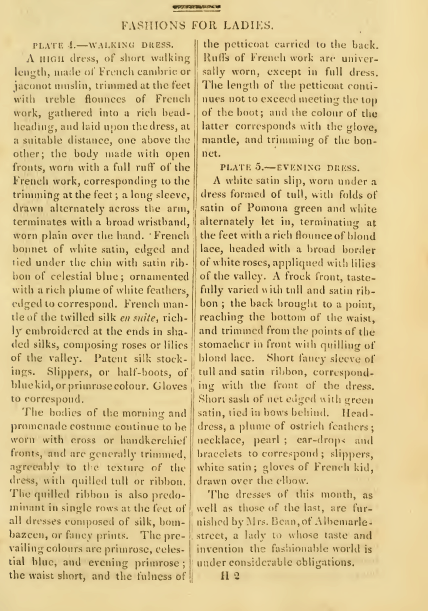 Can you guess how the stripes of the evening dress of plate 5 were made? By interspersing “folds of satin of Pomona green and white” between tull. Was it made in a factory, I wonder, or did some seamstress spend hours and hours sewing rows of satin on that delicate hexagonal mesh? The ribbon adoring the waist and the sleeves is likewise trimmed with net edged with satin ribbon. Roses and appliquéd lilies of the valley head the gown’s blonde lace flounce. A striking dress, is it not? 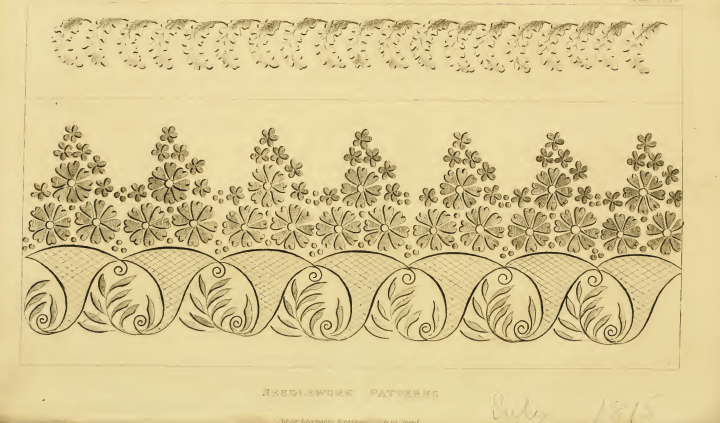 Like last month’s needlework patterns, July’s also include a bouquet-like pattern. Are young ladies’ fancies turning to hints of summer love? 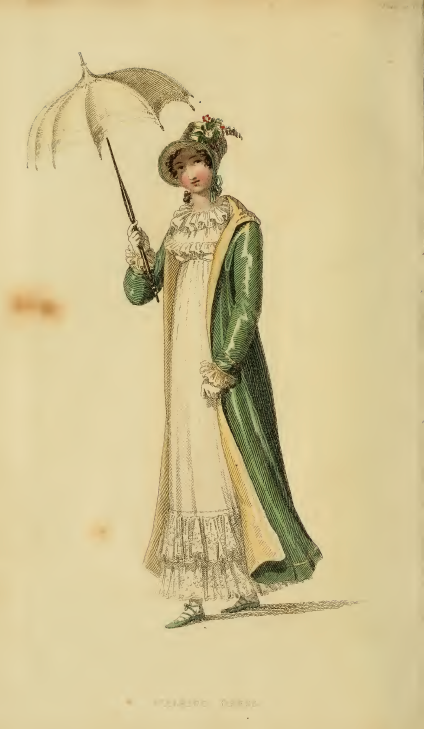 There is no hint of the tragedy of Waterloo hovering about Ackermann’s fashion plates for June of 1815. Not only did news travel much more slowly in the early 19th century than it does today, but journals took a lot longer to typeset and print. 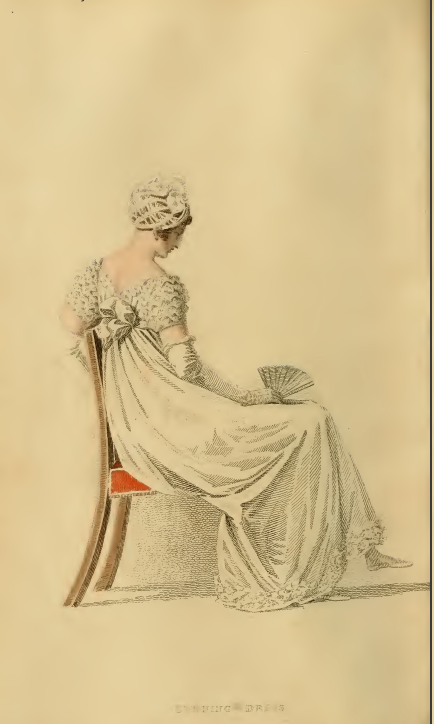 This month’s fashion plates both feature white, one a ballgown of “French figured gauze, worn over a slip of white satin” (plate 28), the other a carriage dress of white satin. The lady of the ballgown is a bit shorter, and more plump, than one is used to seeing in fashion plates of the era, which I (being rather short myself) quite enjoyed! The figure on the gauze of her gown looks to be of a floral nature, complimenting the “wreaths of lilac” separating the skirt from a blond lace trim border. 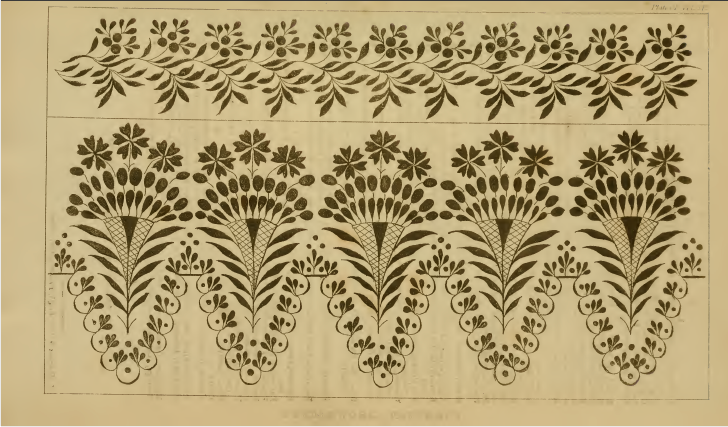 I’m quite impressed by the rich ornamentation at the hem of the carriage dress’s pelisse (plate 29): “clusters of leaves made in white twilled sarsnet, headed (? or beaded?) with tull.” Look at the sharp points of those appliqués! Very difficult handwork there! 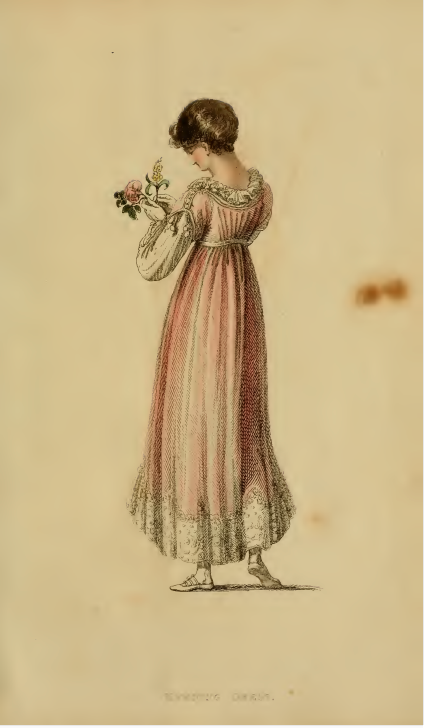 And though the description doesn’t mention it, the print shows the dress under the pelisse with another quite detailed ornamentation round its bottom, a pointed zig-zag trim, perhaps ornamented with beads. 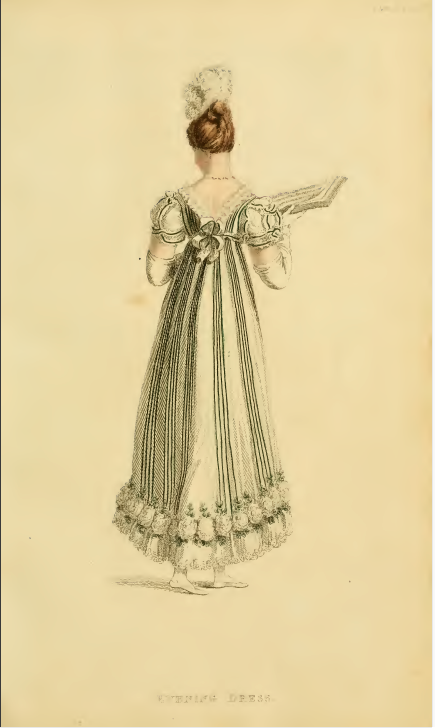 Not to mention that “superb shell trimming of white satin ribbon and tull” around the lady’s neck. It looks so fuzzy; I wish I could reach out and skim a finger across it! 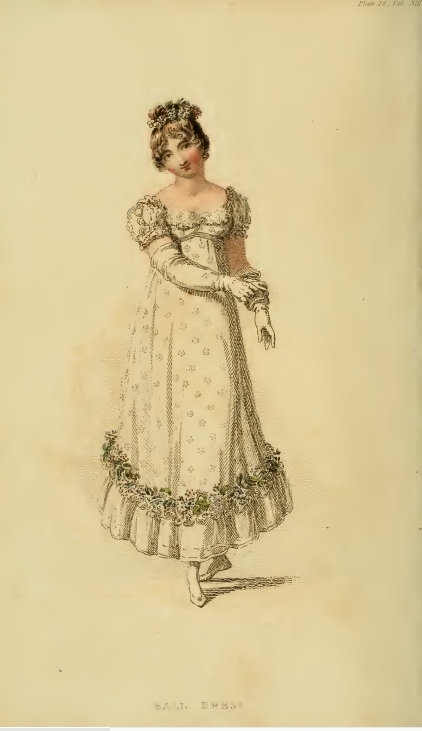 Frills are the name of the game in May 1815’s fashion plates, with both the walking dress of Plate 24 and the Evening dress of plate 25 trimmed on bottom an around the neck with white flounces. 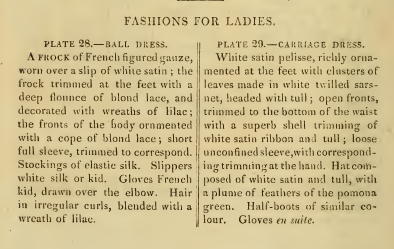 Though in the print they appear to my eye to be made of lace, the walking dress’s deep full flounces above the hem and neck are described as being made of “French cambric” “richly worked.” Perhaps that fabric was embroidered using one of the needlework designs featured in one of Ackermann’s earlier issues? The rich ornament on the hem of Plate 25’s Evening Dress is described as “garnet yewer.” The word “yewer” does not appear in Fairchild’s Dictionary of Textiles, and as the only definitions in the Oxford English Dictionary refer to water pitchers and udders (! ), I’m wondering if this might be a typo. Especially as the trim in question is decidedly not red, but white, in the fashion plate. But I’m having a hard time figuring out what might be the correct wording. Any guesses? Both prints give us a clear look at each lady’s footwear, and how those dainty slippers were kept on her feet. 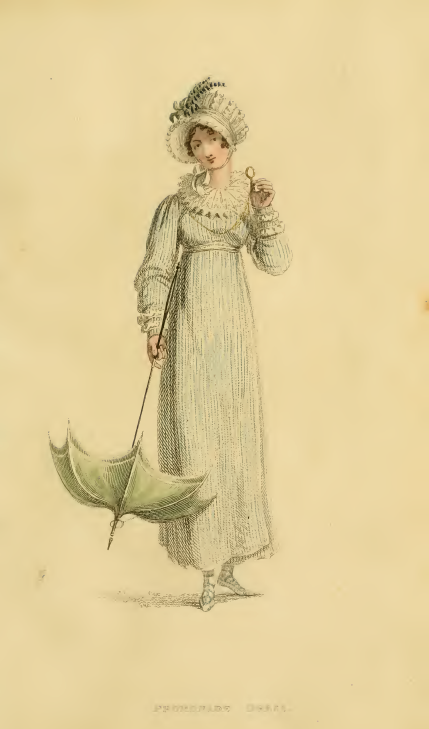 The walking dress features “sandals of green kid,” with 3 bands of ribbon lying flat across the top of the foot before crossing round the ankle and tying in a tiny bow. The white kid slippers look to have only the 3 bands of ribbon—I wonder, in the days before elastic was invented, how well such ribbons would have held a slipper on the foot? 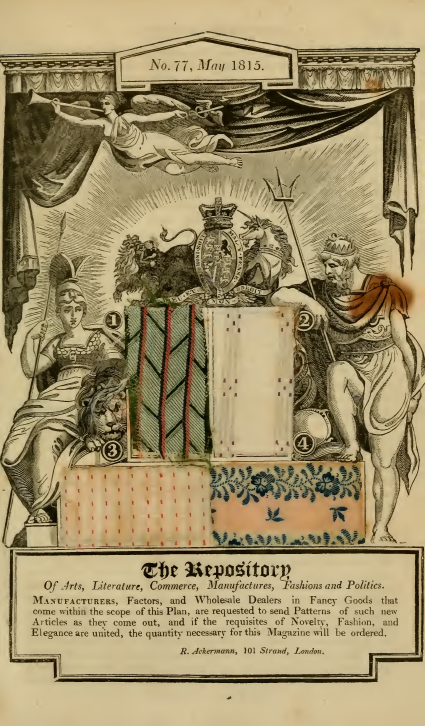 This month’s magazine features fabric samples for ladies’ dresses. Sample one introduces another word with which I am not familiar: “kluteen.” Again, I could find no definition for this word in Fairchild’s nor in the OED; perhaps the typesetter for this edition of the magazine was unusually careless? The “Japanese betilla muslins” of samples #2 & 3 were a little easier to identify; Fairchild’s lists “beteela,” “bethilles,” and “betilles,” all types of Indian muslin. Why these samples are deemed “Japanese” I’m not quite sure (especially as the copy tells us they were manufactured in Britain). 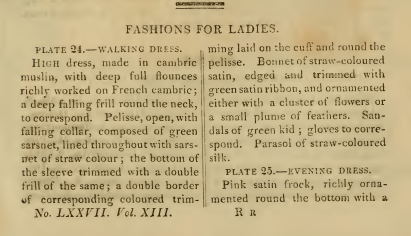 But the description assures readers that “since the interchange with Parisian fashions and the rage for colors have taken place, they are becoming the leading article of the day.” I can picture a morning dress being made from one of them, can’t you? 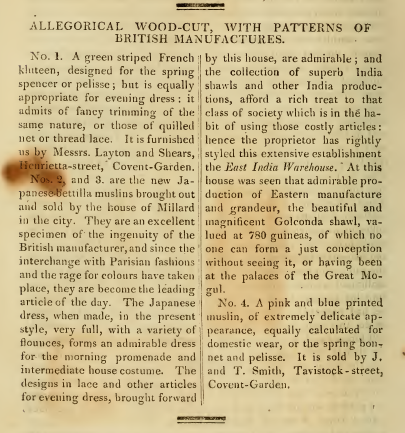 But I think I’d like one more that was made from sample #4, the “pink and blue printed muslin, of extremely delicate appearance.” Perhaps I’ll have to send one of my characters off to J. and T. Smith’s in Tavistock Street in a future book?